The Sun Mar Excel is rated for 3 adults or a family of five on a constant basis or six adults or a family of eight on a weekend or holiday basis. 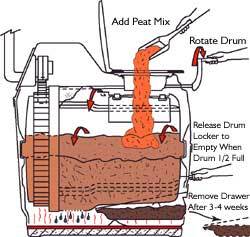 It has a high capacity Bio-Drum that is very simple to operate and aerates the compost so that foul smells are never created. 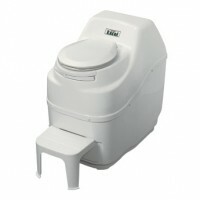 Use the handle at the front to rotate the composting toilet Bio-Drum every two days. Once a month or so roll the drum anticlockwise to drop some compost into the finishing drawer where is remains for at least another month to break down. This method means that use never have to handle any unbroken down waste. The Sun Mar Excel was the first ever self-contained composting toilet to be certified by the National Sanitation Foundation (NSF). This certification means that it does what it is supposed to do. To simulate residential use the Sun Mar Excel was tested by the National Sanitation Foundation (NSF) at maximum capacity for 6 continuous months, during which the Excel produced no odour and produced a clean, safe compost. Only Sun-Mar self-contained units are listed for residential and cottage use by the NSF, whose Standard #41 is the toughest composting performance standard in the world. 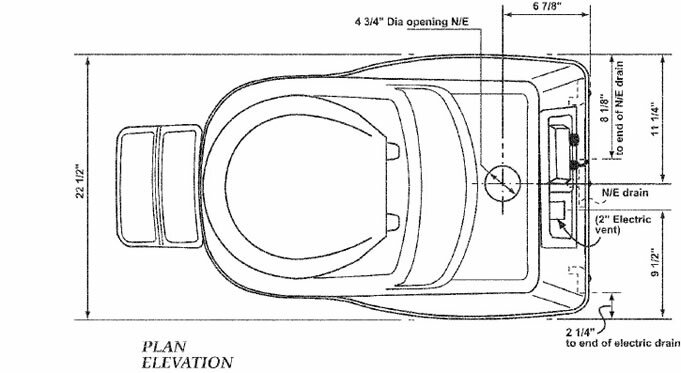 The 2″ vent is attached to the back of the Sun Mar Excel (see drawing below on the installation tab) and can be installed invisibly by running it through the wall and up the outside wall. The fan has an optional (see accessories) speed controller to turn down the fan and a carbon vent outlet filter box to take odours from the exhaust. For comfort the Excel has a sturdy detachable footrest which can be removed to pull out the finishing drawer. 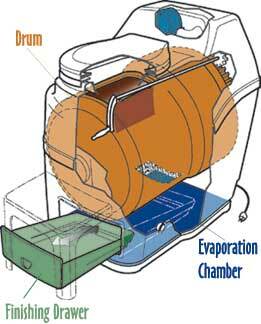 As on all electric Sun Mar composting toilets there is a thermostatically controlled heating element to aid evaporation of excess urine. The heating element also provides a base line temperature to aid composting and ensures that any liquid output is safe. In normal use the Sun Mar Excel can normally evaporate all liquids, however 1″ emergency drain is fitted at the rear and this should be connected if the unit is to be used residentially or heavily, or if prolonged power outages are possible. The vent pipe must always have an upward slope to insure that condensation is able to drain back into the unit. Otherwise the condensation will accumulate in the vent pipe, causing an airflow constriction. All vent pipe that is exposed to the outside or in a non-heated space should be insulated if using the unit during cold weather. 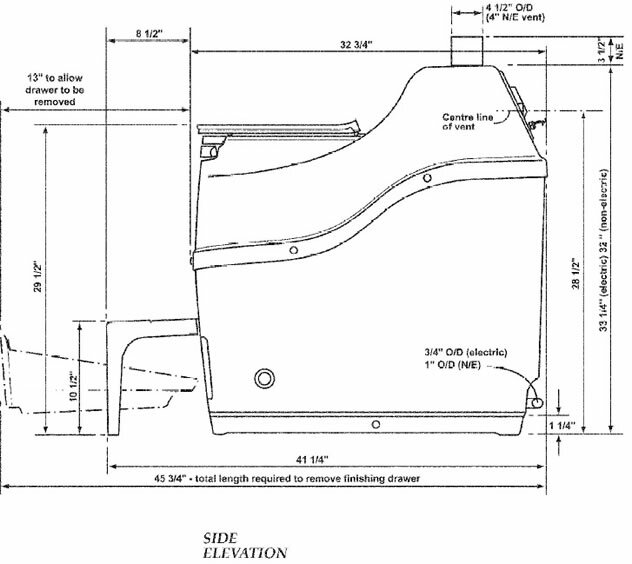 Limit bends in the vent stack to no more than 4 that have a combined total of 180 °. All connectors in the vent pipe should be joined using PVC cement. The only exception is the connection between the vent and the fan assembly where silicone caulking should be used.